Lori, started her martial arts training in 1984 under Grandmaster “Soke” Michael Kinney 10th Degree Black Belt in the styles of Korean Tang Soo Do, Ju-Jitsu, and Aikido, received her black belt in 1990. In 1993, she became a Certified Black Belt Instructor. Later on she became the Head Instructor over 300 students. Lori was respected as a leader to hundreds of students as well as loved. Lori has competed throughout the US in local, state, national, and international tournaments in forms and fighting and holds state championship titles in Florida for three years straight, 1993 to 1995. And had participated as a tournament referee. In 1993 and 1994 Lori was personally invited to audition for the Power Rangers (1994 season) and for the Mortal Kombat national tour. In 1994, Lori received her 2nd Dan Black Belt. In 1996, she received her 3rd Dan Black Belt and 1st Dan Black Belt through the Association of World Class Martial Artist in Ju-Jitsu and Aikido. Lori has received technical training from great martial artists, such as; Bill "Superfoot" Wallace, Wally Jay, Remy Preses, and others. Lori holds a rank in Modern Arnis through Prof. Remy Preses. Lori has been the master instructor over demo teams, camps, exams, and seminars in Florida, Washington DC., Wyoming, Colorado, and Montana. 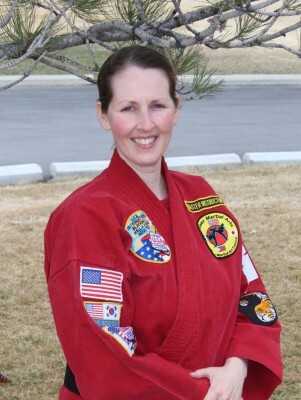 After 1996, Lori relocated out west where she opened up her own martial arts school at a recreational center in Cheyenne and touched the lives of over 100 kids. While out west she continued her training and competing. In 1997, she was Wyoming State Champion and World Champion in Las Vegas International Championships. In 2005, after accomplishing her set requirements she tested for her 4th Dan Black Belt (Yondan Rank) in Tang Soo Do, Ju-Jitsu, and Aikido. In 2006, Lori was Certified by the Eastern USA International Martial Arts Association, Inc., for her Fourth Yondan Rank. She also received the honor of being inducted in the EUSA International Black Belt Hall of Fame “Special Recognition” for authoring her published martial arts training book, "The Art of Self-Defense: The Comprehensive Martial Art Fitness Guide." In the Fall of 2006, Lori opened up a school in Billings, MT, starting at a recreational center. With a great passion in the martial arts, she and her husband decided in the Spring 2007 to open their own studio location in Billings, MT. In 2008, Lori tested for her 5th Dan Black Belt (Godan Rank) in Tang Soo Do, Ju-Jitsu, and Aikido through “Soke” Michael Kinney, her rank was Internationally Certified and received the title of “Master”, she also was awarded with the “Pinnacle Award of Success” through the EUSA International Black Belt Hall of Fame. From 2007 to 2014, Lori has been inducted in the in the EUSA International Black Belt Hall of Fame as; Master Instructor of the Year, Pinnacle Award of Success, Woman of the Year, and Outstanding Contribution To The Martial Arts, and Diamond Crystal Award of Success. November 2010, Lori tested for her 6th Dan Black Belt in Tang Soo Do, Ju-Jitsu, and Aikido through “Soke” Michael Kinney, her rank was Internationally Certified through the EUSA International Black Belt Hall of Fame. In 2014-2015, Lori and Matthew had completed their children’s book series titled, “What Would JeeMin Do.” Now available. The book series is themed around bully and stranger safety.